LYSYCHANSK, Ukraine -- From a dimly lit room at his base in eastern Ukraine, the commander of a battalion of Chechens fighting Russia-backed rebels looked shaken as TV broadcast news of Russian opposition leader Boris Nemtsov's slaying. In this photo taken on Monday March 2, 2015, Adam Osmayev, the commander of a battalion of Chechens fighting against Russia-backed rebels, is in the town of Lysychansk, Ukraine. Russian pro-Kremlin newspapers published reports based on unidentified sources in the security services that accused the Ukrainian government and Osmayev of ordering the murder of Russian opposition leader Boris Nemtsov, the claims Osmayev has denied. Adam Osmayev hailed Nemtsov as a "true hero" both for condemning Russia's war against separatists in Chechnya and for decrying Russian intervention in the current conflict in Ukraine. "Watch them try to tie Ukraine to this (murder) in some way," Osmayev added. But two weeks later, Kremlin-friendly Russian newspapers published reports based on unidentified sources in the security services that accused the Ukrainian government and also Osmayev himself of ordering the Feb. 27 murder of Nemtsov in central Moscow in an attempt to destabilize Russia. Osmayev denies involvement and no evidence has been presented linking him to the hit on Nemtsov, who was a relentless critic of Russian President Vladimir Putin. Attempts to implicate the British-educated Chechen commander appear to be part of efforts aimed at deflecting attention from anyone close to Putin, including his security services and the powerful leader of Chechnya, Ramzan Kadyrov. Within days of Nemtsov's assassination, investigators arrested five Chechens, including a senior officer in Kadyrov's police force, and charged them with carrying out the killing. All five have denied the charges. The arrests heralded a crisis in relations between the Kremlin and Kadyrov, who rules Chechnya like a personal fiefdom. With generous subsidies from Moscow, he has rebuilt the region after two separatist wars and has relied on his feared security forces to track down and kill foes. His men have steadily expanded their sway beyond Chechnya to control lucrative businesses in Moscow and elsewhere in Russia. Leaders of federal law enforcement agencies have watched Kadyrov's growing power with dismay and have made no secret of their desire to curb him. Some observers speculated that the killing might have been ordered by Kadyrov's enemies in the federal government — an attempt to prompt Putin to fire or at least punish the Chechen leader. If such a plan existed, it underestimated Putin's reliance on Kadyrov. The relative stability in Chechnya is seen as one of Putin's main achievements, and he sees the burly red-haired Chechen strongman as key to maintaining the status quo. Russian media, citing investigators, have pointed to a possible link between the suspected triggerman, Zaur Dadaev, and his commander, Ruslan Geremeyev, a senior officer in the Chechen police force. But Geremeyev is in Chechnya and off limits to federal investigators. Some reports claimed that investigators believe Dadaev and his suspected accomplices could have acted on their own, even though most observers agree that a senior officer in Kadyrov's security force would not have acted without sanction from his superiors. Dadaev, in turn, has rescinded his initial testimony, saying he was beaten and pressured to confess. After graduating from Wycliffe College, a prestigious private school in Britain, and attending the University of Buckingham, he returned to his native Chechnya shortly after the second war there ended in 2000. He worked alongside his father, who had been appointed the head of Chechnya's state oil company. Chechnya at that time was led by Kadyrov's father. After his assassination in 2004, power passed to his son, Ramzan, and his relationship with the Osmayevs quickly deteriorated in a dispute over lucrative energy contracts. The Osmayevs fled to Ukraine. In February 2012, Adam Osmayev was arrested at Russia's behest and charged with planning an assassination attempt against Putin. Ukraine at the time had a pro-Kremlin government. Osmayev spent three years in detention until being released in November 2014 by Ukraine's new Western-leaning government. 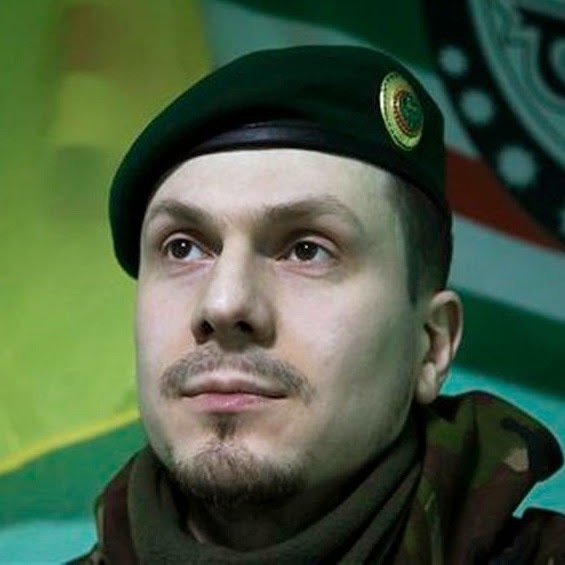 Shortly after his release, he joined a battalion formed by prominent Chechen commander Isa Munayev to fight against Russia-backed separatists in eastern Ukraine. When Munayev was killed on Feb. 1, Osmayav took over the command. His battalion includes several dozen Chechens, many with combat experience gained in the separatist wars in their homeland against Russian army troops. They regularly get calls from Ukrainian army units asking them to carry out reconnaissance missions or diversionary raids behind rebel lines. Hundreds of Chechens also are fighting on the separatist side. They first joined the rebels last summer in the early stages of the conflict, and with their combat gear and professional demeanor they stood out among what was then a ragtag local force. Kadyrov has described pro-Russia Chechens fighting in Ukraine as volunteers, the same explanation the Kremlin provides for the Russians among the separatist forces.